PennsylvAsia: Thoughts on Kizuna Project (絆プロジェクト) in Pittsburgh, November 8. 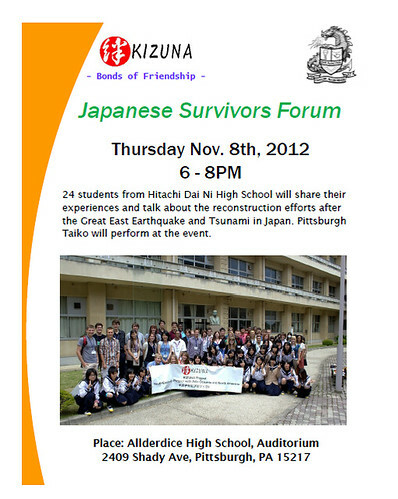 Thoughts on Kizuna Project (絆プロジェクト) in Pittsburgh, November 8. The Kizuna Project has brought 1,000 students from Japan to American high schools, and vice-versa, to “encourage a greater understanding of the youth of Japan and the U.S. by providing a first-hand experience with the culture,” said Noriko Yamamoto. She is program director of the Grassroots Exchange and Education Program for the Japan Foundation Center, based in Tokyo, which is assisting with the project. “I hope this exchange will help us understand each other and make a good relationship for us in the future,” Yui said. The Allderdice students helped raise money for the recovery effort, in part by selling origami paper cranes they made. Some students who visited Japan said they were amazed at how well the nation recovered. There were also brief remarks from local politicians, though the event didn't really need to include them. The mayor's office and city council both issued proclamations, but both representatives left before the Japanese students began their presentations, and councilman Corey O'Connor spent more time chatting about his high school coaching career than appreciating the significance of the Kizuna Project. The students and faculty from both schools have worked very hard to create meaningful bonds across borders and cultures, and their results---not drive-by photo-ops---should take center stage. These particular Hitachi Dai Ni students were in Washington D.C. earlier in their trip, and will head to New York City next.